The World Heritage Road is both a route through Central Vietnam. It is so-called because the route encompasses no less than three UNESCO-designated World Heritage Sites; the sixteenth century silk route trading port of Hoi An; My Son Valley, the sacred remains of the ancient Cham civilization, and the ancient imperial city of Hue. The area is rich in natural history and culture and as such has tremendous long-term potential for the development of road tourism throughout the Indo-China region. Vietnam Heritage Tour – Discover Hanoi Ancient Capital, have chance to get more knowledge about the Hanoi culture and history. – Enjoy delicious seafood and visit one of the most famous cave of Halong Bay. – Discover the combination of royal architect, folk, religious ones, traditional and modern sides in Hue. Visit Imperial Citade, Royal Tombs of Emperor Tu Duc, free time at your leisure at Lang Co Beach. – A UNESCO World Heritage Site, My Son was a capital and religious center of Cham people, spending time for strolling in the town, lazing on the beach, or whatever takes your fancy. You’ll be greeted at the Noi Bai Airport and transferred to your hotel at the city centre. Time will be free for your refreshment. 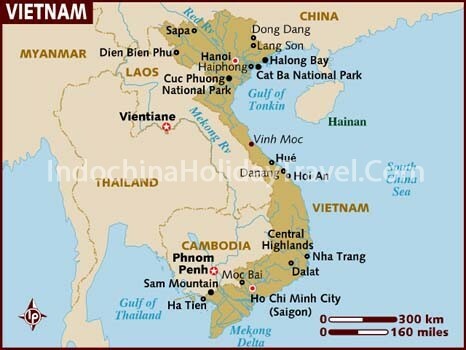 AM: 8.00am – Depart from our Sales office (80 Ma May) for a 3.5 hour drive to Ha Long City through the Red River Delta. Transfer to a traditional wooden junk, for lunch with fresh seafood (vegetarians catered for) while you embark on a 4-hour cruise into the bay to see the incredible karst formations. AM: 7.00 am – An early breakfast with tea, coffee will be available before walking to visit one of the most famous cave of Ha Long Bay – the Amazing cave. Further cruise before lunch. Check-out and back to the Jetty at 11.00 am. PM: Bus transfer back to Hanoi. You’ll then be transferred to Noi Bai Airport in a good time to board a evening flight to Hue. Check-in your hotel in Hue’s centre. AM: Your morning will begin with a guided visit to the Imperial Citadel of Hue, following by a cruise along the Perfume River to the Thien Mu Pagoda. From there, you’ll drive to visit the Royal Tombs of Emperor Tu Duc. PM: After lunch at a local restaurant, you’ll leave for Hoi An. On the way, you’ll cross the Hai Van mountain pass. The views from the top are excellent – you should be able to see Lang Co beach and village, and the lagoon far below, with Danang spread out before you to the south. AM: After breakfast, you’ll be driven to the World Heritage ‘My Son Sanctuary’. Located in a lush valley, My Son was a capital and religious center of Cham people, now remaining with red brick towers and sanctuaries. PM: The afternoon will be free for strolling in the town, lazing on the beach, or whatever takes your fancy.